In David Lynch’s dream-like masterpiece, Mullholland Drive, a young woman travels from Deep River, Ontario to pursue an acting career in Hollywood. At first, “Betty” seems to be as wholesome and innocent as her name implies but is revealed to be the murderous “Diane”. There are many interpretations but I think the movie is partially a modern conceptualization of hell – a place where the damned are continually reminded of their monstrous past. The Eagles wrote about the “Hotel California” and likewise, Lynch seems to portray the “Hollyweird” LA as a place of endless torment for the soul. Ego-driven people are seduced into all kinds of wretchedness(1). Hollywood might look like reality but you will never quite feel at home. It’s the devil’s playground and the Deep River creature is complicit. The film and its monster came to mind when I rented a canoe in Ontario, Canada. Canoeing down the Saugeen river was the only way to see the scenic and sandy Saugeen bluffs as much of the feature is on private land. As a regular vacationer to the shores of Lake Huron, I have oft passed through the town of Paisley, Ontario and heard stories about the nearby river cliffs but lacked time to explore. Far from the glitz of Hollywood, the community of Paisley, Ontario is worth visiting for its small-town charm, quaint stores and cafes. Many of the businesses close in Winter as there are simply no customers. In fact, the streets are often devoid of people in high season! Some of the art is cute; some of it looks psychedelic. For water sport enthusiasts, canoeing and kayaking are among the “things to do” promoted by the Chamber. I thought this was strange as a long-necked river monster might conceivably eat the tourists! At the time, I had never paddled before but nothing would stop me from signing up with one of the local renters. They gave me a two-man canoe and I soon regretted not asking for a kayak. With a dry Summer, the water level was low and huge rocks seemed perilously close to surface. 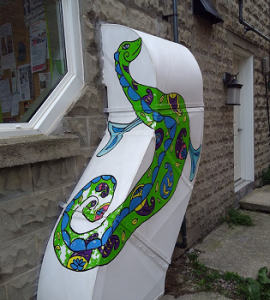 It was too shallow for a great big canoe. In such a situation you should sit on your knees in the middle of the boat so the center of gravity gives you more stability and control. But being new to the sport and overly accustomed to personal comfort, I thought it would be okay to sit on a bench two-thirds back. At first, everything went fine and it was very relaxing paddling down stream. The bluffs appeared on both sides and I started snapping photos. It didn’t take long, however, for white waters to appear. My canoe picked up speed and hazards jumped out. This gentle river seemed like a lengthy, serpentine monster (2)! I was able to navigate around rocky threats (or my canoe simply followed the current flow) but water splashed in and my camera was soaked, along with backpack and clothes. I was enjoying the ride too much to care. The speedy current and spray were exhilirating! Not having my weight at the center, there were many times when I was at the mercy of the wind and it often blew the canoe towards shore. I found myself thrashing around in circles, trying to get back on course! The animals became frightened. Birds looked on gravely, fish darted to one side and closer to the edge, I spotted a turtle diving to safety. Saugie knew enough to stay out of the way. “There is one important common denominator in the majority of our Snallygaster-dinosaur-UFO sightings. They take place near bodies of water … reservoirs, rivers, and lakes. Both UFOs and the tall, hairy monsters seem to frequent swamps, too”. Bodies of water have been associated with shrines and holy sites and some have suggested water might act as a portal to other dimensions. The Mayans, for example, looked upon many of the cenotes as gateways to the underworld. Is it possible that an “otherwordly” creature uses a watery route to pop into our sphere now and then? “Saugie” might be a vehicle for local tourism but there are many sea, lake and river monsters that have been sighted and recorded over history. Examining bodies of water closely, scientists have yet to come up with “smoking gun” proof of Nessie-like monsters but this means little to the many thousands of people who have witnessed them. P.S. In the meantime, consider the following excerpt from David Lynch’s Mullholland Drive. Is the collective unconscious designating Hollywood as an alternative reality, hell-on-Earth dreamland complete with ruler and master manipulator? (And btw, Happy Halloween!). 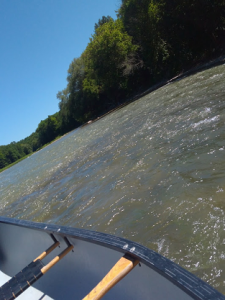 2 Despite my reference to a “monster”, the Saugeen is classified as a Class One River, which means “fast moving water with riffles and small waves. Few obstructions, all obvious and easily missed with little training.” (see https://en.wikipedia.org/wiki/International_scale_of_river_difficulty).